Took advantage of the long holiday weekend to catch “The World’s End,” the latest film starring Simon Pegg, Nick Frost and Paddy Considine. Having loved “Shaun of the Dead” and “Hot Fuzz” before it, I couldn’t resist. And the film is about a pub crawl in Great Britain, so count me in. 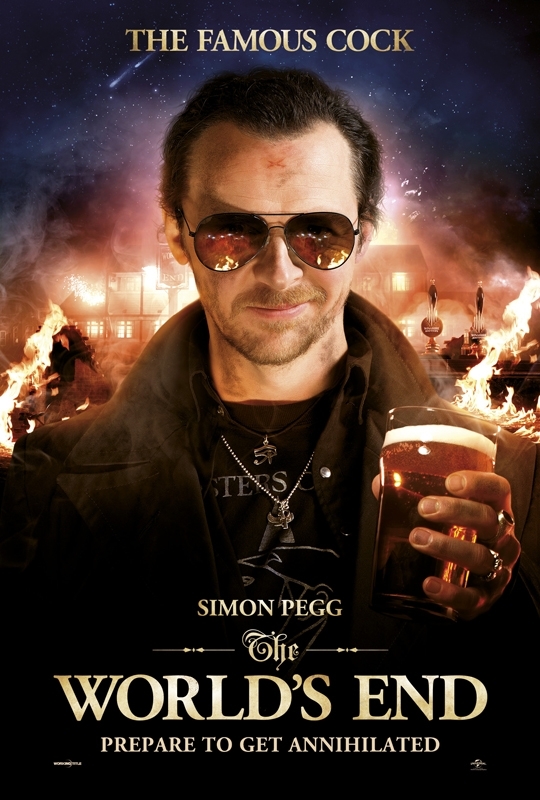 If you are a beer lover (and if you’re reading this blog, you probably are), you need to check out “The World’s End.” Not only is it a hilarious British film and a great commentary on the homogenization of society, it also trumpets the importance of beer. Sort of. The basic concept is that five friends (or “mates”) reunite to complete a pub crawl called The Golden Mile which they had attempted as youngsters, but never finished. Four of the five have moved on with their lives, but Pegg’s character, Gary King, hasn’t grown up. The Golden Mile is all he has. The quintet arrive at the first pub all set to be bathed in nostalgia, only to find that the pub is now sterile and nothing like the dank watering hole they remembered. Anyway, on to the next pub – and it looks exactly like the first one, with the same beer as the only one on tap. “Let me guess,” Frost’s character asks, before reeling off the exact same description. If you’ve ever had pints in England, you’ll get that joke. Possibly even if you haven’t. One of my favorite scenes however, is near the climactic finale when Pegg and the remaining members of his crew are fighting against the originality-destroying robots. Pegg is fighting while simultaneously trying his best to finish off his pint, and his pint keeps getting knocked away from his mouth. Finally, as he kicks aside an adversary and stands poised to polish off his last few gulps of beer, the glass gets knocked to the ground, shattering. Hey, we’ve all been there. There is nothing worse than losing a pint, especially if it’s been knocked out of your hand by a robot that is part of the homogenization of society. Anyway, there’s plenty of that in the film. And plenty of beer guzzling (although the “beer” in the film was actually just sugar-infused water made to look like a golden lager, topped with cream soda to provide a hint of head). Enjoy.